Colombia nightlife offers something for everyone, from sipping mojitos in the plazas of old Cartagena to dancing the night away in the salsa clubs of Cali. Every big city features a host of theaters for inexpensive music and dance performances. And the rural pueblos in Colombia offer the opportunity to escape the noise and relax in the country. Every Colombian city features a Zona Rosa, or main nightlife district, where you'll find the highest density of bars, discotecas (clubs), and restaurants. In Medellin, it's Parque Lleras. In Cali, it's La Sexta. The more popular pueblos, such as Guatape and Jardin, can have a surprisingly lively bar scenes, usually focused around the main plaza. Hostel Rango – Arguably one of the most popular hostels in Medellin. A bit more expensive, a minute's walk from Parque Lleras, but also has nightlife all on its own. Compare on Hostelworld and Hotels Combined. Lleras Park Hostel – Located in Parque Lleras, the city's famous area for bars and clubs, about $8.00US for a bunk, private rooms available also. Compare prices on Hostelworld and Hotels Combined. Hostal Lleras Calle 8 – Located just one block from Parque Lleras, dorms from $12.00US, and privates rooms available. Compare prices on Hostelworld and Hotels Combined. Hostel Mamallena – Located in the popular Getsemani district, this hostel is big on 24 hour a/c, it has a great looking patio and bar on site, free pancake breakfast, dorms from $12.00US, private rooms available also. Compare on Hostelworld and Hotels Combined. Republica Hostel – Located in the walled old city. It has a swimming pool, bar and patio with great music and great vibes, and breakfast is included. Dorms available from $16.50US, private rooms also available. Check availability on Hostelworld. The Cranky Croc – A popular spot with backpackers, it has a bar and cafe on site, has lots of social events, and nicely located in the city's La Candelaria district. Dorms from $11.50US a night, privates available. Compare on Hostelworld and Hotels Combined. Casa Bellvista Hostel – Nightlife surrounds this fun and social hostel, also located in La Candelaria. Split over two buildings located a block from each other, it offers a daily free continental breakfast as well. Both dorms and private rooms available, dorms start at $9.00US a night. Compare on Hostelworld and Hotels Combined. Local House Hostel – Offering free breakfast and free salsa lessons, this hostel is super close to “la sexta” party district in Barrio Granada. Dorms from $8.50US a night, private room are available as well. Compare on Hostelworld and Hotels Combined. El Viajero Cali Hostel & Salsa School – Entertainment aplenty on the stage in their bar area, there is an outdoor swimming pool as well. Breakfast is included, and the hostel is located in the San Antonio area, which is the historical center. Dorms from $11.00, compare on Hostelworld and Hotels Combined. Colombia nightlife is pretty quiet Sunday through Wednesday, unless you know the right places to go to (ask the locals). Otherwise, Wednesday and Thursdays offer ladies night at certain discotecas, which can help bring out the locals. Friday nights are popular, however Saturday nights are the busiest nights of the week. Arrive early (before 11 PM) to get a good table at discotecas on the weekends, and avoid any lines at the popular places. Closing times vary by location, however most regular bars close by 2 AM, while discotecas stay open until 4 AM, with some late, late night venues in big cities staying open until dawn. Dress codes apply to a very small minority of high-end clubs in the big cities. 99% of the time you won't need to worry about dressing up for a night of partying. For both men and women, jeans, t-shirts, and sneakers are fine. Colombian women take great care in their appearance, and tend to dress up more then the men. The majority of bars and discotecas in Colombia play what's known as “crossover” music. This simply means the DJ's mix up the popular genres of Latin music, including: salsa, merengue, vallenato, reggaeton, bachata, and cumbia. This can be a little confusing if you're not already familiar with Latin music, however the variety is appreciated by most Colombians (versus going to an all-reggaeton or all-salsa club). Most Colombians go out partying in groups mixed with friends, boyfriends/girlfriends, and family. It's not unusual to see girls out partying with their sisters, cousins, aunts and moms. At the start of the night (9 – 11 PM), everyone will be inside the bar or discoteca drinking and talking within their social groups. As more alcohol is consumed, and the venue fills up, there's a tipping point where more and more people start getting up to dance. If you get to a club early, don't be surprised if you just see everyone sitting around. Give it time, and an hour or two later the girls may be dancing on the tables and chairs without abandon. As a result of the group dynamic, it can be hard for travelers to meet Colombians at bars and clubs. The best approach is to be friendly and straightforward. The guys should ask a girl to dance, or start a casual conversation. Offer the people at the table next to you shots of Aguardiente to help break the ice. When all else fails, just have fun and go with the flow. If approaching social groups isn't your style, or proves too difficult, check out Colombian Cupid, an online dating site. 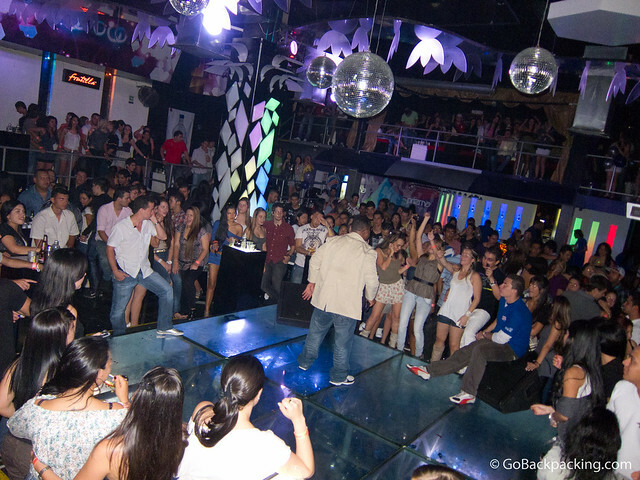 Dancing is central to the Colombia nightlife experience. To get the most fun out of your nights, take a few salsa lessons ($10 – $12/hour for private lessons). Colombians are polite, and most will dance with someone when invited (out of proper etiquette). For the guys, reggaeton music is easy to dance to — just ask the woman to dance (bailamos), or slide up next to her and she'll do the rest (if she's interested). For foreign women, even if you're use to inviting guys to dance in your home country, it's not normal in Colombia, and the Colombian guys might feel uncomfortable if you approach or ask them. Colombians love to dress up and party for Halloween. Overall, Colombian women have a positive reputation as being very friendly and approachable. The prettier the girl, the more important it is that you speak Spanish if you expect to talk with her and build rapport. The hottest ones know they're hot, and have their pick of the litter, so they're unlikely to have patience for a gringo who can't speak the local language. Unlike in Western countries, girls will freely give out their phone numbers, which is in no way an assurance that you'll actually see her again. The man is expected to make all the phone calls. If interested, a girl will call a guy, however they often hang up before the guy answers to ensure they are not charged for the call. It is then expected that the man call her back. Text messaging is not an effective way to communicate with most Colombian girls (again, costs money). The exception is women from wealthier families who can afford smartphones, such as BlackBerries, and therefore have data plans and access to BlackBerry Messenger for texting. Colombian society is still very traditional, and many women are on the lookout for their (foreign) knight in shining armor. Or at least a proper first date (dinner, drinks, dancing, movie), before things get physical. All men, both Colombian and foreign, should be on high alert for women using them for their money. Sign up for Colombian Cupid to start meeting girls today. Colombian men are passionate, have an especially macho persona, and are known to be jealous (just like the women). There's a high degree of infidelity in Colombia (which works both ways). While foreign women do date (and marry) Colombian men, most foreign girls I've talked to are less than interested in the local guys (which is the exact opposite for foreign men visiting Colombia). There are exceptions. Here's a little insight into what into lessons learned from a Western woman dating a Colombian man. Most Colombians live with their parents or extended family until they are married. Unless you're dating a professional, it's unlikely you'll be spending the night at a Colombian guy or girl's home. Out of necessity, love motels are widely available throughout the country, and offer privacy and comfort for couples looking for intimacy. Always use protection. Condoms are available at all pharmacies and drug stores, and even the cheap ones from a bar or discoteca bathroom are better than nothing.If possible, bring your favorites from home as the selection is limited. The morning after pill is available at pharmacies. Abortion is illegal. The 138-page, all-original Medellín Travel Guide by David Lee is now available for Kindle and PDF.